Har Har! One archive for Web performance and beyond; Implemented in Firebug and HttpWatch: "
Steve Souders has posted about the HTTP Archive Specification and how it is now supported by both Firebug and HttpWatch (and hopefully more soon!). What’s needed is an industry standard for archiving HTTP information. The first step in establishing that industry standard took place today with the announcement of HttpWatch and Firebug joint support of the HTTP Archive format. HttpWatch has long supported exporting HTTP information. That’s one of the many reasons why it’s the packet sniffer I use almost exclusively. Earlier this year, as part of the Firebug Working Group, I heard that Firebug wanted to add an export capability for Net Panel. I suggested that, rather than create yet another proprietary format, Firebug team up with HttpWatch to develop a common format, and drive that forward as a proposal for an industry standard. I introduced Simon Perkins (HttpWatch) and Jan “Honza” Odvarko (main Net Panel developer), then stepped back as they worked together to produce today’s announcement. The HTTP Archive format (HAR for short - that was my contribution ;-) is in JSON format. You can see it in action in HttpWatch 6.2, released today. HAR has been available in Firebug for a month or so. You need Firebug 1.5 alpha v26 or later and Honza’s NetExport add-on (v0.7b5 or later). Here’s what the end-to-end workflow looks like. After installing NetExport, the “Export” button is added to Firebug Net Panel. 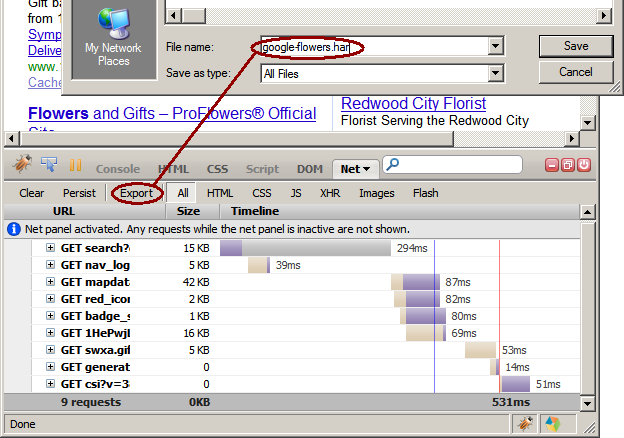 Selecting this, I can save the HTTP information for my Google flowers search to a file called “google-flowers.har”. I’m incredibly excited to see this milestone reached, thanks to the work of Honza and Simon. I encourage other vendors and projects to add support for HAR files. The benefits aren’t limited to performance analysis. Having a format for sharing HTTP data across tools and browsers is powerful for debugging and testing, as well. One more block added to the web performance foundation. Thank you HttpWatch and Firebug!